Peel potatoes and mash them with the vegetables. Add green chilies and coriander leaves. This mixture now is full of energy and health benefits. Add salt, garam masala and mix well. 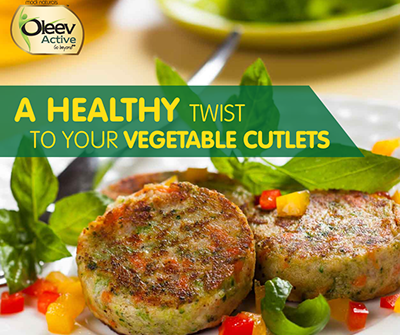 Divide the vegetable mash into small portions and flatten them or form any shape. Dip them in Maida batter and roll in bread crumbs. Deep fry in Oleev Active till they are golden brown. For deep frying you can try Oleev Pomace oil as well, it has a neutral flavour.